Monochrome photograph from an album of postcards and photographs taken by Mrs J.I.C. Mackay of Dornoch. with an incorrect album annotation 'The Grange before Bishopfield was built up'. 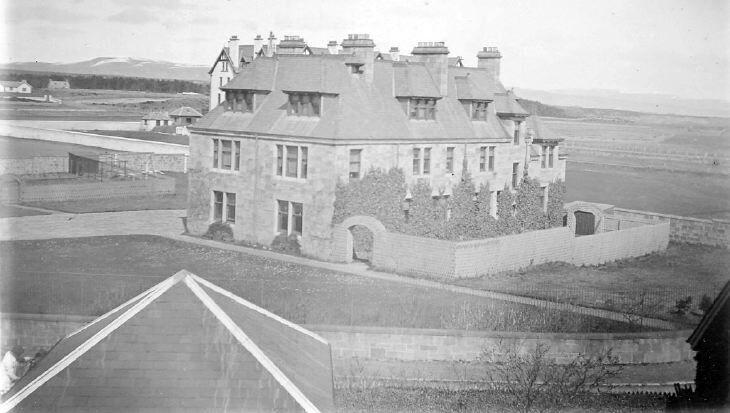 This is a photograph of 'Abden', which became Ross Hostel and then Ross House, built by Robert Hamilton Bruce across the road from 'The Grange', which he also built and owned. 'The Grange' became the Royal Golf Hotel. A postcard with the same view and printed 'Abden' annotation is at picture #21. The Station Hotel, later to become the Dornoch Hotel is the building beyond Abden.